Craft of choice: I love to repurpose fabric and random objects, like zips and bottle tops. I love to sew and cut paper and play with resin. Who are you and what do you do? 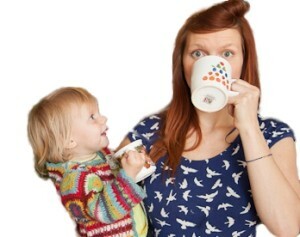 I am a mother, a blogger, a feminist, a vintage lover, a crafter, an activist and also a bit of a cheapskate. I work as an activism officer for Oxfam half of the week and craft and blog and play with my little girl Ramona for the other half! How do you get into craft? I am often motivated into craft by being thrifty – I refuse to go to the shops and buy things when I think I can just make it. This means we have a house full of handmade and partially functioning items, and friends receive gifts still sticky with glue. However, I also think some people (maybe even most) are ‘makers’ and that it is good for our souls. I am one of those, I get twitchy if I am not crafting regularly! 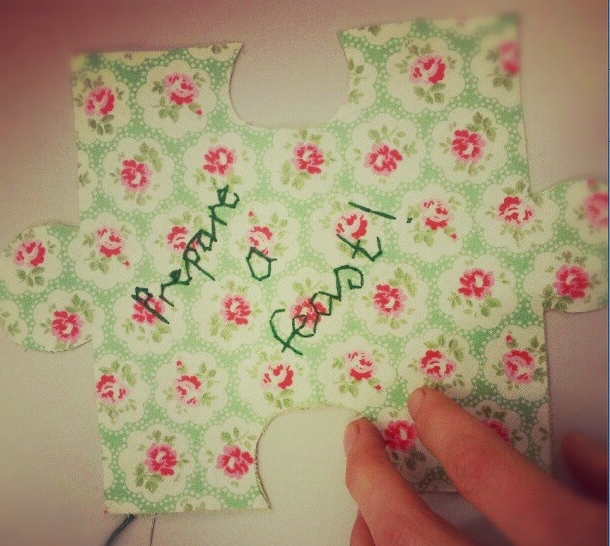 Why did you decide to get involved in the Craftivist Jigsaw project? I am passionate about creating a world where everyone has enough to eat, where people are free to work and play and speak the truth, to have shelter and health, and to thrive. The Jigsaw project brings crowds of people who also dream of this world together; it is a collective action making it resound so much more. It is creative and fires people’s imaginations; people who don’t perhaps see themselves as activists are inspired to get their voices heard. What have you stitched on your piece and why? “Prepare a feast!” I was feeling hopeful, visionary, and imagined a massive banquet table, bending under the weight of nutritious food, enough for every single belly to be full. You can read more about my piece right here. What do you love about craftivism? We can have all the policy and problem solving in the world but without art and creativity we remain apathetic. Beautifully stitched words that surprise us as we walk past a fence spur us on to change things, to join a movement of other people who care. Craftivism is also good for the stitcher – the stitching act is reflective but the act of putting it in a public place also a little bit nerve-wracking – and doing something a bit scary for a cause makes you feel alive!